What are vitamins and minerals? That is an easy question because they are simply substances found in the foods we eat that are needed for our bodies to grow, develop and function properly. Knowing this, as well as having access to the lists of our RDI’s (recommended daily intake), shouldn’t this tell you enough about what type of daily multi-vitamin you should choose? Or whether you should even be taking one? In our society it is just not that simple. Take the book store for instance, there are shelves upon shelves of books advising us to take this and not that based on so many aspects of our lives and lifestyles. Many of these books are written based on personal experience and not scientific evidence so it likely will not be for everybody (or anybody). A billion dollar industry: dietary supplementation. Is it because we think that more is better? Well, sure, if you are using this mantra when it comes to fruits and vegetables. So where should you begin? Should you ask your doctor or talk to the local nutrition store clerk? Should you purchase online or from your doctors office? I may not be able to answer all the questions, but I hope this can serve as a beginning point towards your personal best choice. After each of my children were born I was told that my children needed to be taking a vitamin supplement. Considering I was a full time nursing mother and eating quite well before, during and after the birth of my children (not to mention being well educated in the field of dietetics) I chose to opt out of supplementation. Although, by the time my second child was 2, our newly sought out and current pediatrician, introduced us to the supplement we now use daily. My initial reaction had been quite similar to when I was told by the previous pediatrician, but due to my personal requirements in a supplement of any type and the fact that I could see I had a selective eater on my hands, I felt it was surely something we could all benefit from. Is it whole-food based? Are the ingredients coming from food or synthetic forms of the nutrients? Can you decipher amongst the jargon? Is it free of artificial additives of any type? Are the ingredients non-gmo and organic? Is there research on the product itself? Is it getting into my body, blood stream and working as opposed to exiting in a form such as when it went into my mouth? What is the labeling saying about the product? Is it safe? Does it contain what it says? Can I be sure it is not tainted in any way? And what about the label itself? 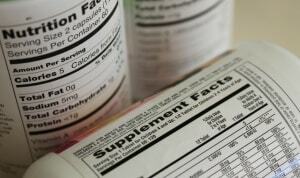 Is it a supplement label or a nutrition label? 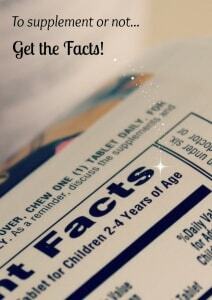 Did you know that a label with a Nutrition Facts panel is a food label? What about other experts? What do they look for? Not too long ago I had the pleasure of attending a lecture that one of my favorite pediatricians had offered. Dr. William Sears simply expressed that we need to get our nutrients from food first, then find a supplement that can offer added insurance of what may be lacking in our food intake. Sounds logical to me. Dr. David Katz has been cited many times regarding that supplementation is not the cure-all, but it may help. He also recommends whole-food based supplementation but cautions you to still take care of other aspects of your life such as eating well and being active, just as he has clearly stated in his recent book. Yet again, this seems logical as well. So why are we still so confused? Am I drinking half my body weight, (in ounces) of water, daily? So for a 130lb person that would be at least 65oz of water. (A vital part of our diet that helps in the transport of nutrients). Am I not exceeding the daily limits of alcohol? (Too much can lead to nutrient deficiencies). Am I limiting myself on the amount of caffeinated beverages? (Why? Because too much caffeine can have an effect on our nutrient absorption). Am I eating enough omega-3 fats? (Simply, we need good fats to use fats). Am I getting the recommended amount of sunlight? (Think vitamin D here). And the clincher: Am I eating the recommended daily servings of 7-9 fruits and vegetables, and a variety of them as well. (We won’t even get into the subject of organic vs. non and the idea that our soils are greatly depleted, leaving our food less rich in nutrients in comparison to our great ancestors). If any of these questions are answered negatively, then it may be time for you to consider supplementation. If you are pregnant, this opens a whole new door into supplementation for which you should speak to your physician as well as a dietitian who specializes in women’s health. There are concerns such as pregnancy and bone density that need to be taken into consideration. In my personal and professional opinion, I feel that a woman is in such high demand on a daily basis (especially moms, right?) that she needs to amp up the volume of fresh fruits and veggies to help keep her healthy and more often than not, we just do not take the time to eat a nutrient dense meal. Perfect scenario for a superb form of supplementation. Even still, there are some physicians who are beginning to question supplementation due the fact that synthetic blends and isolated nutrients may be doing more harm than good (key word: synthetic and isolated). 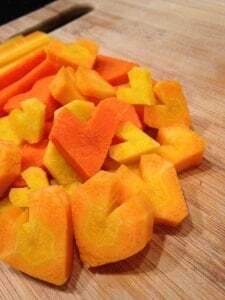 Food for thought: Did you know that too much isolated Vitamin A in a women’s diet while pregnant can cause birth defects and complications? Should we just eat more orange foods? Again, I feel it is necessary for you to talk to your pediatrician first and then head to a dietitian who can help you determine their needs based on a thorough food intake analysis. Considering that there are many parents struggling with not only selective eaters (myself included) but many food sensitivities and allergies, it is likely a good idea to find a high quality whole-food based supplement for your children. An amazing woman I have been watching for a few years now, Kris Carr, has a great video with her treating physician. Now, I know she is battling a whole different story with cancer, and it is not kid specific, but they touch on the subject in similar ways as mentioned above. You can check that out here. Her physician also points out that we are in a toxic world and need the supplementation to assist our bodily functions in running smoothly. Ok, so maybe these are not five things to ask, but it is such a broad subject and there are many things to take into consideration. Are you still confused or maybe just concerned? Speak with a registered dietitian and you will be advised based on your food intake as well as your overall lifestyle. We are all individuals and there are truly so many aspects that can be taken into account. In the end, its more important to first eat a variety of wholesome, fresh foods and then cinch it together with a reputable, whole-food based supplementation. With such a laundry list of resources and many different avenues that can be taken with this subject, here is just a glimpse of my readings due to this article. And please pass on any other great finds you may have! Are synthetic forms of vitamins/minerals ok? Can you share which supplement you currently use? Hi Erin, sure! I use Juice Plus+. The link is just above here, in the reference area where my name it. A little off topic but any advice or good reads on incorporating more fruits and veggies for picky eaters. I get overwhelmed in the grocery store with so many things. I dont want to waste money and I dont even know how to prepare it. My family and I just dont like the taste of veggies. How do people get past that? We eat a few traditional things but I am dying to be more healthy. And then what about the list of things we are supossed to buy organic, is it ok to eat them non organic? 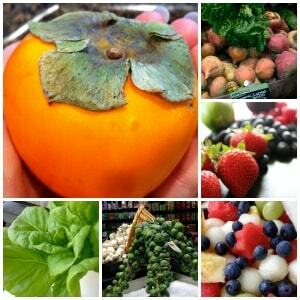 I feel awful putting pesticide ridden fruit and veggies into our body. But is that even completely believable? I wish someone could just tell me what to do in one fail swoop! I should point out that JuicePlus is NOT a multivitamin. It does not address RDAs or note the vitamin and mineral content of the product, beyond a very few. Yay! I was just going to ask if you take juice plus! 😉 good job mama! Once I saw Dr Sears and Dr Katz…I was like she must be a juice pluser! Yay for JuicePlus! This addresses all the reasons why I chose JP and is so easy to share. Thank you. Correct. Juice Plus is not a multivitamin. Juice Plus+ is whole food nutrition. It is juiced, dried, and encapsulated fruits and vegetables in the ratios of nutrition that nature intended. Hence, why it carries a food label as opposed to a supplement label. The government mandates that Juice Plus+ standardize 4 vitamins and 2 minerals in the product (which is only 6 of the 25,000 plus phytonutrients, at the moment, that you find in fruits and veggies). This is a different type of scenario than what you will find other companies face since they are offering multivitamin supplements as opposed to whole food based supplementation. First of all, you are not alone. Our site is filled with some great ideas and I am not just being biased. When I first joined the Super Healthy Kids team I too needed to add some more creative ways to get my family to enjoy a larger variety of fruits and veggies. The best advice for you right now, is to begin small. Gather the family and talk about some foods they may already like. For instance, lets say your family likes steamed broccoli. Then begin to offer this the way they like it for the next few days. On the 3rd day, make it a bit differently, maybe roasted in the oven. If they oppose to it, don’t get in a tizzy, just let it be. Getting it on the menu is a great first step. Most people like pizza, so try adding steamed broccoli to your pizza. If that does not go over well, then maybe back it up a bit and blend the cooked broccoli into your marinara or pizza sauce. The other part of your question: you can pull up a list of the dirty dozen and try to purchase those organic if you can. But, please do not keep those foods completely out of your diet if it means the organic is not affordable. I like my veggie wash for all my produce, and you could easily start there too. Just being sure to thoroughly rinse off your produce before consuming. Buy in season too. It is always less expensive. 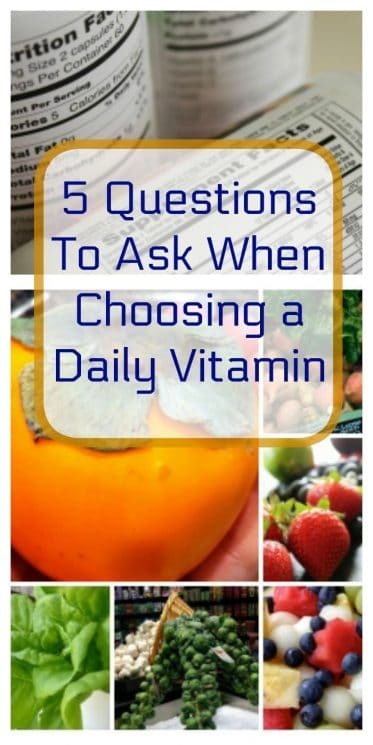 The title of your post suggests that you are recommending a vitamin or mineral supplement. Just pointing out that it’s deceptive to suggest Juice Plus is a vitamin OR mineral supplement. It is neither. Also, how many capsules equal an apple, or a serving of broccoli? I appreciate this article very much. With so many different supplement companies being looked at, and even sued, because of false labeling (what they claim on the bottle not matching what is actually in the product), it’s nice to see the 5 questions listed in your article. As a RD I too get asked that question a lot. I go through similar questions with my clients as well. We should always try our best to get our nutrients from food. With a high percentage of people not even coming close to the recommended servings of fruits and vegetables every day I hesitate to recommend a vitamin that in turn could prove more harmful than helpful. I wish there were more RDs in a public forum to offer good advice like this. Thank you so much Chrissy! It means a lot to have other dietitians speak up. And yes, with two RD’s currently here at Super Healthy Kids, we would love to have more RD’s comment! So please share this, or any of our other informational posts, if you are also on LinkedIn and Twitter.